Two months ago, 3640 of us met together for EARTH/ENERGY, NCECA’s 47th annual conference in Houston, Texas. One of the reasons I’ve become so interested in working to develop and analyze post-conference surveys for NCECA is to see what we can learn about demographic shifts in our membership and conference attendees. Direct feedback that arrives in response to surveys can also provide insights into the interests and attitudes of those people NCECA aspires to serve. NCECA started in the mid-1960s as a group of “potter teachers,” to quote Robert Turner, NCECA President,1969. In 1970, our organization began to encourage student memberships, and in the following year, half of new memberships were students. At the 1972 conference, 77% of the nearly 800 attendees were students. Survey responses can tell us a great deal about where an organization’s efforts are successful, where they need work and whether they have a degree of relevance to those they are meant to serve. The limitations of what we can learn from surveys are that the information received depends on the quality of questions posed and the size and scope of the respondent population. Based on responses to NCECA’s recent post-conference surveys, one can surmise that our organization today is evolving from a predominantly academic base to one that is significantly comprised of full-and part-time studio artists. ***Please note, as with any survey, there is a “margin of error” in the generalization of the survey response group to the whole. Our response group was large enough to provide a 95% accuracy with a margin of error of about 3.5% (This is generally considered a valid and statistically representative sample). But what is the actual composition of the organization now? In our post-conference survey, we asked members to define themselves into one of a variety of groups. We do understand this was difficult, as many of us often fit into more than one category. However, we were able to get a good breakdown into 12 groupings, plus one catchall “other” category. (Note: The category of “retired” was not a selectable option on the survey instrument, but was provided frequently enough as descriptive open field detail for “other” that it was converted to its own distinction on the chart at left. In analyzing the survey data, we further consolidated the categories above to a streamlined selection of four basic categories. It’s interesting to note that based on the survey responses, the combined number of educators and students at our conference is less than the number of those who described themselves primarily as artists. We also collected demographic data on gender distribution. Historically, our conference has been largely comprised of men. Now, however 69% (again, +/- 3.5%) are female. We also looked at prior conference attendance and found that the largest group of people in Houston to be first-time attendees. Similarly, the largest group of attendees by years of membership was made up of people who have been members for less than a year. 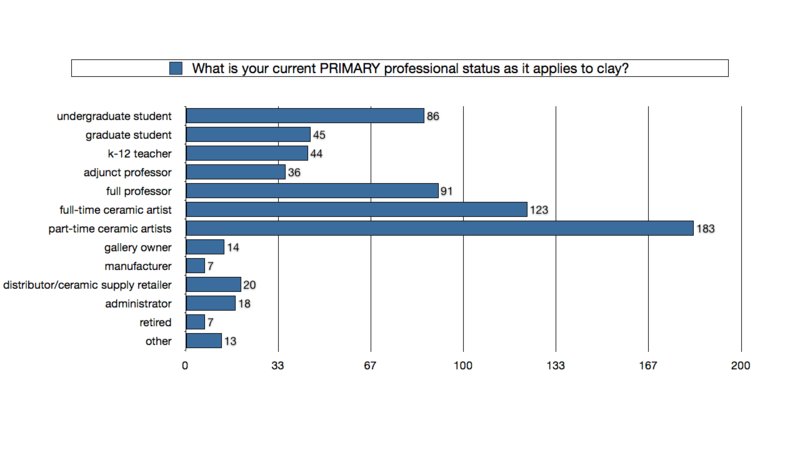 As with the survey results from our conference programming section of the survey, the board paid careful attention to these demographics in our efforts to be a member-focused organization. Full results of the survey will be posted soon. Stay tuned to the blog for all your NCECA news. Excellent information.. Thanks to you for doing the analsys and thanks to everyone for filling out the forms. Thanks for sending out the survey and letting us know what the results are. I am surprised and happily so that there were so many young people participating.